Punting is a head game. The psychology of the punt rules, OK. Here I am sitting on three losers in a row. I got one back at Betfair Park on Wednesday, but mid-weekers don’t really count, do they? So I’ve consulted my psychological advisers, The Missus and Giovanni Pesci, and they both tell me that I need to go back to basics, to do what I do best. Back standout horses for a place. Get back on an even keel. Keep two feet on the ground. It’s all about confidence, Geoffrey. They tell me that my head is too confused in those last frantic minutes – is it a back or is it a lay? What is my password? Can I get matched? Just do the one thing – what I am good at! They reckon they can tell from observing my own body language on TVN that I’m not doing well. They fancy themselves as people watchers. I’m listening. So, today is standouts only. Back bets only, no lays. And for me a standout is when I have crossed out every horse in the race bar one. And the bar one must look good. I walk into Caulfield and see one straight away – Launay. Head down, relaxed, with winkers which I still don’t like much, but it’s only a five horse field and $1.10 the place is nowhere near my threshold of $1.75. So no bet. Nothing much till Velocitea in the sixth. Again relaxed, and with the opposition having faults – a bandage on Time Matters, and Solchow restless and kicking in her stall. But $1.10 the place? Please. The seventh, the Typhoon Tracy stakes. Won’t be much action here with six horses and the Typhoon at $1.10 the place. But I love races with five, six or seven horses. If you can pick second, the divvy is often quite exceptional value. Typhoon Tracy looks well, fit, and head down, although mucking about with her head a bit. Snipers Bullet shows me a burst of fizz, and Joku is sporting a small worrying bandage and goes into the barrier riderless. Dao Dao looks great. So, if I ignore the Typhoon I have a five horse race with a standout. A bet! Need I say more? Dao Dao surges home for second and $2.80 for the place on the tote. The Typhoon manages $1.50 for the win! I think I’ve got my feet back on the ground. And there was only one occasion when I briefly jumped up. Toorak Toff in the fourth was a quadruple dumper and ran sixth, but my place lay at $2.00 wasn’t matched. Blue Diamond day. Hot and windy. Another flying hat day. A north wind day. A losing day! I saw some lovely horses. 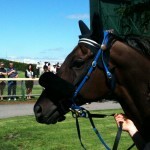 Littorio looked terrific, Willow Creek was nice and relaxed, and Headway is my favourite horse. Littorio soldiered on for fourth, Willow Creek was desperately unlucky, and I’m sure Headway hit the front at the 100 before being swamped in the last 50. But none out of three, whichever way you cut it, is still a loss. Isn’t it funny how losing makes you feel much less expansive. It’s nothing new though. My place strike rate varies between 52% and 65%, so on average every second or third horse is a loser, and I probably lose one meeting in every five. The north wind got a few of them going. Rostova was kicking the boards off the back of her stall and so I laid her for the place at $1.74 and she did nothing in the race. And a few others were letting rip too, including Vigor and the Oakleigh Plate winner, Starspangledbanner. So kicking can’t be all bad. The champ, Weekend Hussler, also let fly with a few after the race, so he can’t have been feeling too lame either. Denman looked nice, but just for me he did a small dump in the mounting yard, about 200 micrograms, just to make sure that I was paying attention. And Changingoftheguard had a nice erection in the parade ring. I ran after him to get a photo, but it had all collapsed by the time he got to the mounting yard. And that’s how he ran – like a pricked balloon. What’s that word Phillip Adams likes using? Detumescence. I don’t always go to the races. Sometimes, you can catch me in a library. Today I’m back at my old stamping ground, the University of Melbourne, searching the literature in the Baillieu Library. In the olden days this was a real pleasure. Flicking through the card catalogue, breathing in the smell of musty old journals in the catacombs, and then robotically Xeroxing a stack of interesting papers. These days it’s all computer searches, huge online databases, and ejournals, with not even the faint whiff of a musty electron. And no photocopying – I just email the results to myself or bung it all on a geek stick. I come here maybe once or twice a year, when the students are on holidays. I mainly search the horse behaviour literature, but I also wander off into gambling psychology, equine exercise physiology, efficient market economics and other horse racing trivia. I’m thinking about the long-awaited sequel: Watching More Racehorses, as I scroll through interminable lists of references. Or how about: A Punter’s Progress. Or: Son of Watching Racehorses. Maybe: Watching Racehorses Rides Again, but that is probably a bit too Hopalong Cassidy, or was it Destry?. My reverie is suddenly interrupted. I might have been scooped! Nicholas Rose and Susan Blackmore tested a psychic who claimed to be able predict the winners of horse races. That would put me out of business! Unfortunately they didn’t take him to the track but tested him at home and in the lab on a computer horse race and with toy money. In the end they did 210 tests and he predicted the winner 21 times. Did I tell you there were 10 runners in each race? So his performance was exactly what you would expect by chance. And the interesting thing is that when he was interviewed later he was convinced that the results confirmed his psychic powers! I can relate to that. Another title grabs my attention: “The influence of religiosity on gambling participation”. Now my religiosity is extremely low and my gambling participation is, well, quite high, so I was intrigued. But in the end it was a let down. The authors concluded that there was a significant difference in the frequency of religious participation between gamblers and non-gamblers. And the more types of games played (casino, horses, lottery, bingo) the lower was the frequency of participation. Well it just seems common sense to me really – you simply have no time left for God. And finally, there was this one: “Do bookmakers possess superior skills to bettors in predicting outcomes?” Let’s jump straight to the conclusion: “Employing a conditional logistic regression model on horse racing data from the UK we find that, in high liquidity betting markets, betting exchange odds have more predictive value than the corresponding bookmaker odds”. More power to the punter! It has been raining cats and dogs in Melbourne so I’m feeling a bit nervous about the punt. I don’t bet if my racebook gets wet or if the track is worse than dead. It is rated a Dead 5, which is very borderline. I’m there early for the first because I like the two-year-olds. And I’ll ignore that light sprinkle on my racebook. Is that really water? I cross them all out, except In Faith, who gets divine assistance and streets them on the line. I’m feeling quite smug because it’s the first time I’ve pulled off a back and a lay in the same race. I took an exception to the beaten favourite Tizona, who was very unsettled with the jockey up and didn’t keep four feet on the ground. So I conclude that the track can’t be too bad and I’m up for another go in the next. Again, I cross them all out except I Need To Fly. My place bet with the bookies, at $4.60 no less, flounders and runs home 12 lengths last. Back to where I started. There is obviously something wrong with the track! I check the race times with my chart of par times compiled by the late and great E.J. Minnis and discover that it is hovering between Dead 5 and Slow 6. Time to shut up shop. In Race 5, the strapper of Still Me (who I later discover is the jockey’s father and trainer’s spouse) confides that the horse doesn’t like it wet. Still Me, who hasn’t won in three years, wins in a canter. Is this track wet or dry? I risk another bet on Silvercitymiss in the mares race. Fifty metres from the line and the horse is hopeless on the rail and going backwards. I turn away from the TV and don’t watch the rest. The track is too wet. Greg Miles says there is a photo for third, with Silvercitymiss in it, which seems impossible. I watch the replay and can’t even find the horse’s colours. The photo comes up and it gets third. How can that be? I look at the replay another four times. Two metres from the line she is fifth and then in a miracle, two heads up and one down, she gets the photo. So, 1/2 backs, 1/1 lays. But the most interesting thing that happened all day was when I fired up the betting instrument it displayed a list of available networks, and there was the name “simon beasley”. That must be some comfort to Simon, to know that his computer can still come to the races, even if he has been rubbed out for four years. I’m still in laying mode, but with some trepidation. The technology is giving me a very hard time. The other night I was idly flicking the screen of my betting instrument when it suddenly froze and went all white, much like its owner. Yikes! I couldn’t turn it off, I couldn’t turn it on! After much shaking, tapping, fiddling, flicking, pressing and swiping it finally succumbed, and agreed to switch itself off. Phew! And now everyone is telling me horror stories of iPhones freezing after only a few months. I rush to the filing cabinet to check if I took out an extended warranty. Phew! I place the instrument carefully aside and swear not to touch it till race day. It’s very windy, in fact, it’s a flying hat race day. Mine only lasts till Race 3 when an almighty gust rips it off my head, despite the safety rope. Horses and humans, we all hate it. Girls in mini skirts daren’t venture outside. I carefully remove the delicate instrument from my pocket for Race 4. I’m going to lay She’s Got Gears. Shane Templeton on TVN announced that she hasn’t got the bandage she wore the other week when the stewards inspected a couple of stitches on her hind leg and passed her fit to run. But often they are hard to see, especially black or grey bandages on bays. Sure enough, she’s still got the bandage. So I’ve got inside information that the TVN punters don’t have. And I caught her eating straw in her stall, which is a definite no-no. So it’s a lay. With fingers crossed I press the button, and the instrument fires up, no drama. I’m on at $1.84, and She’s Got Gears does the right thing by stalling in first and dropping to the rear, but suddenly, she finds top gear on the corner and flies home for second. A pity I laid her for the place. And I’ve doubled my play money bet too. Another chance in the sixth. Here De Angels, a well-known barrier rogue, appears with multiple head gear. A nose roll, ear muffs and a tongue tie. But he seems remarkably poised, and whilst I would normally oppose a nose roll horse, his head shows no signs of rejecting it. And the ear muffs are probably a huge plus, considering the gale force wind. Maybe he’s a back bet. I’m still debating the matter in my head when they jump, and the Angel sprouts wings to win. Another chance in the eighth. Bird Of Fire has the nose roll, but has her head up as well, a definite sign of unhappiness. She is $1.90 on the tote, but I’m forced to take $2.16 on Betfair. She never gets set alight and I’m counting my money on the corner. I’m starting to get used to this laying business. I like the favourite La Rocket in the last, so it won’t be a lay. But it’s hovering above my $1.75 limit on the tote and with 30 seconds to go I dive in. He fizzles out a bit in the straight, but hangs on for third. I’m crestfallen when the dividend is crunched to $1.60. But 1/1 backs, 1/2 lays, and a betting instrument that is still alive. I leave the track smiling. I am on a mission. I am only opposing horses today. A test of the new punting paradigm. After all, I am better at picking losers than I am at picking winners. My first goal is simply to keep my betting instrument alive for the whole day, which means my thumb will get a workout on the refresh button. And my second goal is to successfully lay a horse. My first chance is in the second, a 3YO fillies race. I’m logged in nice and early and note that the favourite Depasse is under a strong hold and is resisting the jockey on the track. Into the bar with two minutes to go. A quick scan of the odds and I go for it. A tap on the lay side and the sophisticated betting instrument has a heart attack. The screen goes blank and I get stuck with the download sign, that revolving sun symbol. Frozen! Yikes! And of course Depasse runs like a dog. Another chance, in the next. 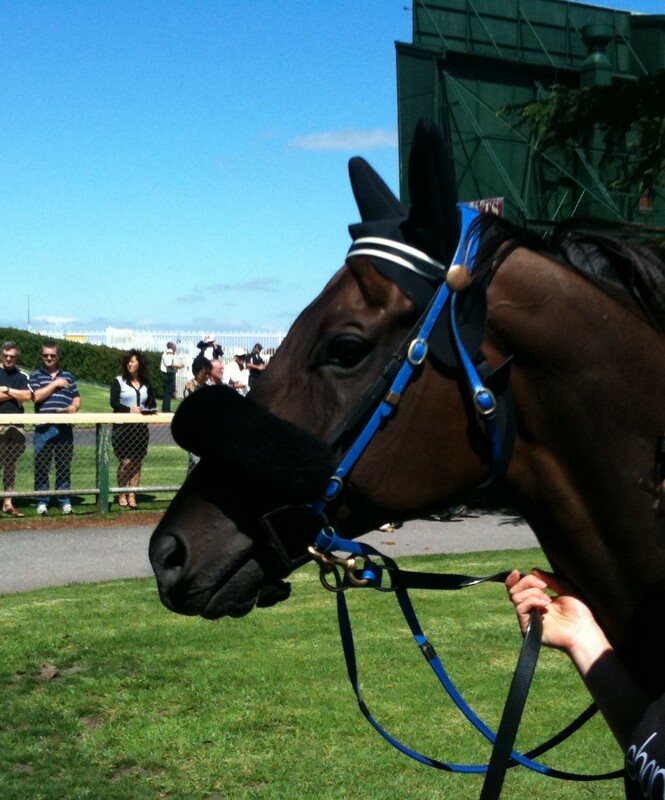 Not the favourite, who is very unsettled, but Shining Bullet, dumping all over, struggling strapper. I’m still alive on my betting instrument, and the bullet is showing $2.70 the place. Over my limit, but lay, lay. I’m on but not matched. It’s blowing out, I’m left behind. Revise the bet to $3.00. Unmatched! Blooming flaky markets! The bullet doesn’t fire. Last chance, Pinatas in the fifth. And I’ve failed in my first goal, to keep my betting instrument alive. Login again. One minute to go. Lay available at $1.67. Take it. Matched. I can’t believe it. I’m on. They jump. Pinatas does nothing. Thank goodness. One out of three horses layed. One out of two goals kicked. Hope the coach picks me next week. I’ve obviously still got a few technical problems to overcome.